Women's Swimming coach Jimmy Tierney talks with three young female athletes. 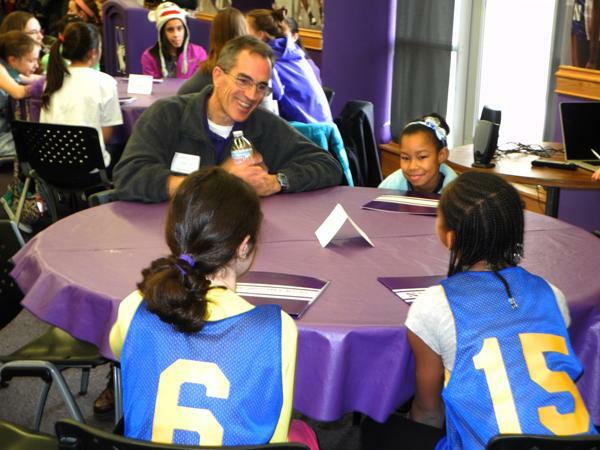 Tierney, along with three other Northwestern coaches, participated in roundtable discussions for NU's second annual celebration of National Girls and Women in Sports Day. In celebration of National Girls and Women in Sports Day, ESPN journalist Sarah Spain spoke to the Northwestern athletic community and dozens of young female athletes from the Chicago area about the lasting positive influence of sports on women. The event, the University’s second annual celebration of the national holiday, was held Sunday in Welsh-Ryan Arena before the women’s basketball game against Ohio State. Spain, a former college athlete and current espnW columnist and ESPNChicago.com reporter, delivered the keynote speech to about 75 people. Following Spain’s speech, Cheryl Raye Stout, Chicago sports reporter for WBEZ.org, along with members of Northwestern’s cross country, volleyball, women’s field hockey, women’s soccer and women’s swimming teams, field hockey coach Tracey Fuchs, women’s soccer coach Michael Moynihan, women’s swimming coach Jimmy Tierney and assistant cross country coach Patricia Loughlin participated in roundtable discussions with the young girls in attendance. Maureen Palchak, assistant director for marketing and community relations for Northwestern Athletics, said one of the main points of this event, which was open to girls in the 4th through 12th grade, was to allow the young girls to learn about life as a student athlete and what it takes to be a successful one. Spain also lamented the lack of opportunities, like the event’s discussion, available for young female athletes when she was growing up. She urged the young girls in attendance to take an interest in female athlete role models like those from NU. While speaking about her work with espnW, Spain mentioned that female athletes are often more accessible to fans than male athletes are, both as methods of inspiration and in their willingness to build a relationship with an up-and-coming athlete. Spain opened her speech with her own experiences growing up in sports, including her time as a heptathlete at Cornell University. 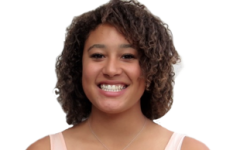 In explaining some of the lasting positive effects sports have on young women’s lives, Spain spoke about the significance of Title IX and described some of the studies and articles espnW published last year as a part of the bill’s 40th anniversary. Spain noted that younger girls have the interest in sports that boys do, but they begin dropping out twice as often by age 14. She repeatedly encouraged her young audience to stick with sports throughout adolescence and adulthood. Janna Blais, Deputy Director of Athletics and Student-Athlete Welfare, commended NU’s student athletes in attendance as well as Spain for serving as role models to young girls involved in sports. Blais said Spain has added value as a former female athlete and member of the media.